The focus on community is strong in Denver, and one of the ways that this is showcased is through our 170 metro area community gardens. For the past 33 years, the nonprofit Denver Urban Gardens (DUG) has taken the lead in helping area residents plant these nourishing organic terraces throughout the greater metro area. Those who participate in community gardening are 25% more likely to get their daily recommended servings of fruits and vegetables than those who do not participate. The gardens bring together multi-generational community members, with programs that pair seniors and school-aged children to help teach tried-and-true methods of growing. Area gardeners donate approximately 25 tons of produce each year to friends, family, and food assistance centers, adding to community spirit. Gardening has been shown to increase feelings of satisfaction, life value, and provide a stronger sense of unity. 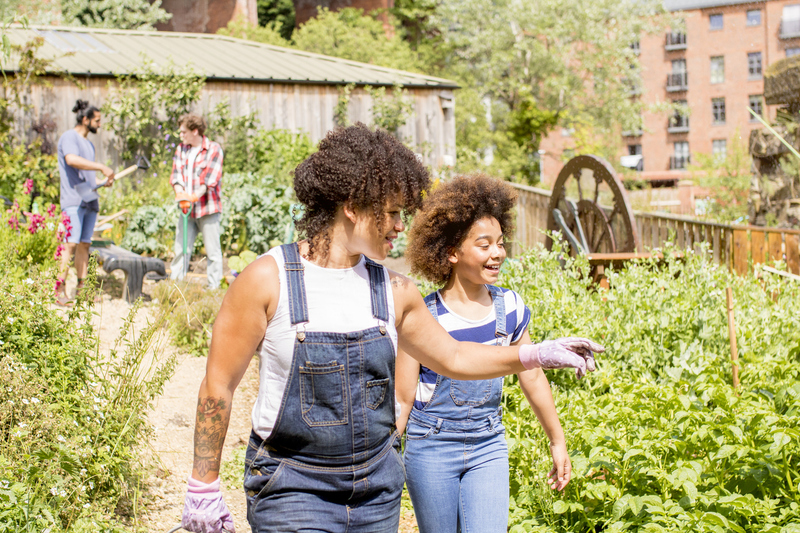 Take a look at our top 4 picks for Denver area community gardens that are promoting healthier living and a supportive, cooperative neighborhood vibe. The Urban Farm at Stapleton was established in 2008 to provide gardeners with the option to either lease or join a gardening cooperative in the community. In addition, the farm itself presents seasonal seminars by Master Gardeners on beginning and intermediate co-op growing. You can also take fun tours to visit the horses and other animals, learn about the working beehives, and shop for eggs and fresh produce while you’re there. Their youth programs work with local schools and organizations, such as 4-H, to educate school children on cultivation practices and cutting-edge aquaponics and aeroponics techniques. The Stapleton Greenway Community Garden has also been in operation for 10 years and offers over 10,000 square feet of garden space that includes 30 sizable plots. The garden’s namesake park even commissioned famed sculptor and architect Lars Stanley to create artistry that depicts ‘tools of the trade’ and local plant species. The designs are meant to celebrate the industrious nature of Denver’s residents. The upscale community of Cherry Creek sits just 5 minutes from downtown Denver and is the sight of the innovative Bromwell School Community Garden. Here community members, local Slow Food mentors, and children who attend the elementary school classes all come together to grow fresh fruits and vegetables. Students have the opportunity to learn to seed, composting, cultivating, and healthy cooking ideas from leaders in the clean eating movement. They can even sell their ‘creations’ to the school cafeteria to be invested back into the project as part of the Garden to Cafeteria program. Nestled in the northwest suburbs of Denver is the beautiful neighborhood of Highland, home to Highland Gardens Village Community Garden. The garden sight has a fascinating history as the former home of Elitch Gardens Amusement Park, which operated there from 1890 until 1994. Once the park was moved to downtown’s Central Platte River Valley, community planners had the foresight to create a neighborhood that utilized environmentally-friendly development methods. Here you’ll find wind power in many of the multifamily homes and senior apartments. Developers also left quite a few of the area’s original trees and green spaces undisturbed. The garden itself contains over 30 small plots covering more than 5,000 square feet of planting expanse. Contact us at Dyllan Real Estate today to take a tour of our impressive homes near to Denver’s vibrant and welcoming community gardens.